I see it all the time. People go to view a caravan (normally privately) full of excitement and high expectations and this tends to blind them from some of the things they should be checking for. Checking these things could potentially save you money and even prevent an accident or injury at a later date. For a video on how to perform a damp test click here. And there we have it! A comprehensive check list of things to check when you are viewing a caravan to avoid expensive and potentially dangerous surprises in the future. I hope you have found this list valuable, please share it with your friends and colleagues if you think it is something that may help them too! Let me know your thoughts in the comments section below, do you have any checks of your own to add that were not on the list? Excellent and thanks very much! I’m selling the house and thinking of buying a Compass Rallye 644 o r Elddis Crusader Cyclone 645 to live in here in NZ. if you know of any particular bad points in these models to look out for , i would like to know. Both lovely vans. Around 2006 there were some damp issues with the Compass so do be cautious if buying around that age. Good luck with the house sale! 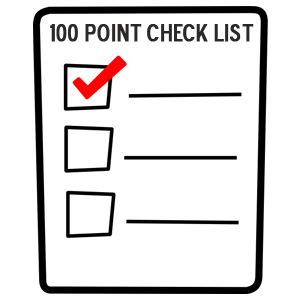 Many Thanks for your helpful articles on checking out damp and the 100 point check list. I have found that most of damp damage seems to originate when caravans are built using staples which rust easily and thus cause water ingress. I am surprised that the industry is allowed to use self destruct materials such as these. Thanks again for the help. Hi Barrie, thanks for your comment, just pleased I can help! Water ingress is most certainly a caravan manufacturers biggest challenge, it is not one I would want to attempt to tackle, after all, the body is moving and flexing all the time. I am pleased to see 10 year water ingress warranties with many of the brands, it shows that they have confidence in their products. Hi Josh. After reading this, I think that we will keep the tent! Haha Nick, I know it looks daunting doesn’t it. But buying a caravan is very much like buying a car, knowing what to look out for when viewing can save you considerable money or save you from buying trouble all together. Most things on he list are a quick glance. Don’t let it put you off, caravanning is well worth it! All the same, camping is great too! I am guessing it will be around 2004-2005 model? If so, Avondale caravans were pretty solid then. I don’t know of any particular problems that model suffered from. With that being said, still make sure you do a thorough damp test (I recorded a video demoing how to carry out a damp test here). It’s a lovely caravan. I hope it serves you well and you enjoy it! My pleasure Wesley, just glad to help! Having the heating on will not have any impact on the damp readings, if there is moisture in the wood it will still pick it up. If you have type of moisture meter that has different settings then “wood” is the ideal one. You should be pretty safe with a dealer, they are obliged to offer a warranty with the caravan and so it shouldn’t be damp when you buy it from them. But best to do your own checks all the same. Hi josh. Just completed our 1st trip in our ”97 Swift Challenger 400 SE. All systems worked perfectly except for 2 out of 3 strip lights & the cassette player. I rate that as a result. Things we’ll do different & better next time. Tent up for sale tomorrow! Thanks for your input/advice. It really did help. Cheers, Nick. I’m really pleased to know that the website has helped you out, it makes it all the more worth while for me and always spurs me on to continue writing so thanks very much for your comments. Where did you take your caravan on its first trip? Always interested to hear about nice sites to recommend to people. First of all welcome to the world of caravans! I’m sure you’ll have a great time. The Emerald (4 berth with dedicated end washroom I think?) is a nice caravan. I don’t know of anything in particular that was wrong with these caravans. Just be sure to check for damp as always and make use of the 100 check list. Like a car.. If the caravan has no service history should I walk away? Fantastic! Glad you found it useful! I wouldn’t necessarily say walk away if it has no service history, just be vigilant with your checks. I would however expect it to reflect on the price or at least leave it open for negotiation. You could always ask about previous services, if they have had some services doe but doesnt have paperwork to back it up you could find out who serviced it and contact them to see if they have a record of the service. Hi I am buying a 2005 fleetwood heretage 640eb with fixed bunks – any thing I need to be aware of ? Nothing comes to mind with an 05 Fleetwood, they were lovely vans, particularly the Heritage. Just be sure to carry out all the normal checks for damp etc. I hope all goes well with your new caravan. Great checklist! Thanks for taking the time and effort to share your experience and knowledge. Question about using a damp meter on wall boards. How hard should you press? I heave read that you need to break the surface on order to get a proper reading. If this is so, how far into the board should one press? I expect this should be done in unseen areas, such as under beds, in lockers and under window rubbers? What about checking the floor? Again, should one puncture the surface to get a reading? Grew up in a caravaning family and taking the leap from tents to caravans… Viewing an Elddis Shamal XL 2000 this coming weekend…hope it’s ‘the one’ ! Thanks! I’m just glad to help. Let me be the first to welcome you back to caravanning! Yes, when you use the damp meter on the wallboard you need to slightly penetrate the surface. The best way to know how hard to push is to judge by the readings, anything really low like 1-2% is unrealistic. You should expect 8%+. You should only need to pierce the surface. As you said, try and do it where the holes won’t be seen. When testing the floor you should stay under the bed boxes. Don’t mistake a delaminated floor for damp (spongy floor), this is just where the floor has seen too much traffic and the wood is separating. Good luck with the Elddis – I hope everything is okay with it and its what you’re looking for! Hi. I have been looking at a 2 berth Swift Challenger 400 se caravan today then I saw your 100 point check list and damp test . Must take a copy with me as I am going back on Friday to have another look but is there anything else I should be aware of , Its a 1994 model. My partner and I may convert from camping to caravaning but are complete novices in buying caravans, HELP!! Thanks for stopping by. I would say the main thing to look out for in a 1994 would be the damp – if you haven’t already pick up a damp meter so that you can test all the main points that I mentioned in my video. Pay close attention to the floor too, caravans of this age can suffer from a delaminated floor. Good luck – I hope all is well with it! So pleased I’ve found your YouTube clips I’ve learnt so much already and I don’t even own a caravan yet!! We’ve narrowed down our choice to a 2berth Coachman Amara 450, the layout has a lot going for it over the other 2 berths we’ve looked at. This is our first caravan , the great British weather has finally finished off our love of camping, we intend at least one weekend a month ( adult children still at home, so this is our bolt hole) then a week at Easter, summer and October, can’t wait to go to all the places we’ve wanted to go to but haven’t been able to camp at cos of the weather. We’re off on Friday to view a 2009 coachman armed with a damp meter and your checklist just wondered your thoughts on the model and make and anything we should look for structurally, thank you for your info. We bought our second caravan today, a bit of an upgrade from our old but much loved Lunar Jupiter. We’ve found a Bailly senator which hasn’t been emigrated to Australia. I found your web site and have spent the last two hours looking through your previous posts and articles, absolutely brilliant, namely your 100 point checklist for viewing, (luckily I did remember most of them) And your pre flight checklist which will be printed off, laminated and stuck somewhere prominant!! Glad to know you’ve found the information useful! Keep on caravanning. Noticed your comments earlier in the page with respect to problems with damp with Compass caravans around 2006. I’m just in the process of buying a Compass Omega 482 2006 model . Is there anything I should specifically look out for in the light of your comments. I/we are thinking of getting back into caravaning and have found your comments very helpful. As I said we are going back to caravaning after about eight years, but this time round are lucky enough to be able to buy new, our last family van was a Avondale Landranger twin axle, I found the twin axle very steady and safe in all road conditions/type. So again we are looking at twin axles! I hope this may help your readers. P.S. As a must do for buying second hand , always check CRiS registration documents against owner details and van details! This is fantastic Josh, thank you. We are off to look at a 2007 Compass Corona 362 tomorrow as a first caravan. This list will be coming with us…thank you again. Hi Josh, Thanks for the pointers, I was just wondering why you haven’t put on your list checking windows for year of manufacture, I’ve seen some dodgy dealers selling caravans that are older than stated in their advertising , this is a ‘must check ‘ for me now.